I hope you all had a great weekend! We definitely took advantage of having a couple of days with no plans to relax and catch up on a few things. I have a really busy couple of weeks coming up (all fun stuff, but busy!) so a weekend with no plans is like a dream. Also, it's supposed to be BEAUTIFUL here this week and I can't even wait. I live my best life in sunshine + a swimsuit! I've been looking for an inexpensive, slip dress for a while now and loved this neutral one from the moment I saw it. I knew it needed a chic layering piece to give it an extra, little something, so I found this leather jacket that did just the trick. I've invested in a few leather jackets over the years that are timeless and I love, however, it's so fun to purchase a trendy one every now and then. I love almost anything floral and mixing it with leather is the perfect, masculine addition. I've already worn this jacket with a few other pieces and it's so, so chic for Spring + Summer! LOVE this outfit! 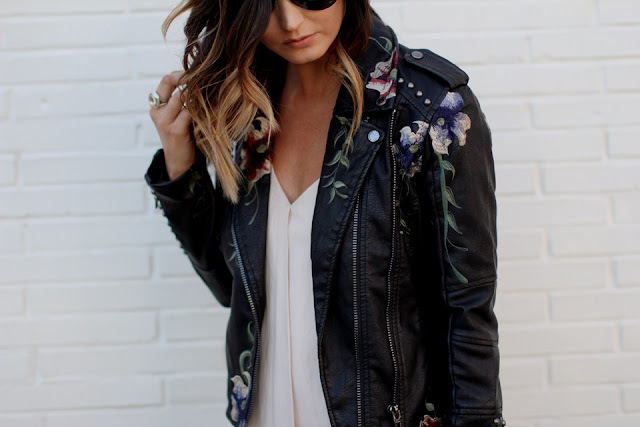 That moto jacket is seriously gorgeous! Oh wow, your jacket and shoes are to die for!! I'm in love with this combo top to bottom!